In a major move, leading global energy and services group Engie has taken over Cofely Besix Facility Management (CBFM) after acquiring the the remaining 50 per cent of the shares formerly held by Belgian construction major Besix. The new entity has now been rebranded as Engie Cofely. Established in 2008 as a partnership between Engie and Besix, CBFM is the region’s leading provider of complex FM and energy service solutions, with over 2,000 employees operating in the UAE and Oman (with its partner Daud) on many iconic landmarks such as Dubai Mall, the Al Sufouh Tram and Abu Dhabi Airport. This acquisition is the result of Engie’s strategic ambition to become the world leader in zero-carbon transition, developing energy-efficient assets and putting into practice a unique integrated approach, enabling the company’s accelerated growth across a broad spectrum of services while servicing clients’ evolving needs. Engie CEO for Middle East, South and Central Asia and Turkey (Mescat) region Sébastien Arbola said: "This move is a game changer for Engie in the Middle East, as it provides us direct access to expanded capabilities to meet our clients’ needs." "It integrates into our portfolio a technical services team with a strong local and regional reputation and provides a robust platform for future development across the region," he added. Engie has been present across the GCC for over 20 years, establishing its position as a leader in power and water production with a total gross portfolio of 30 GW power and over 4.5 million cu m per day of desalinated water. 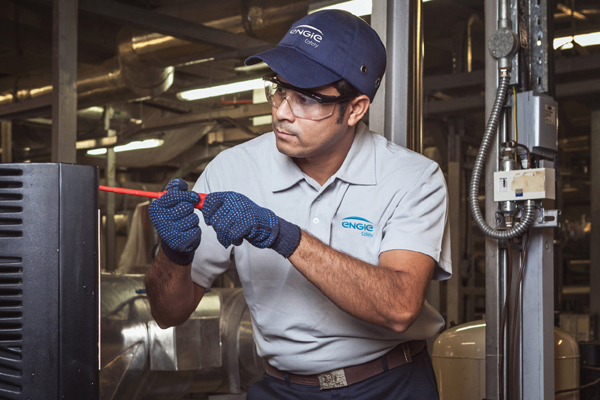 Globally, the group employs 100,000 people devoted specifically to energy efficiency. Engie Cofely CEO Ian Harfield said: "We are excited to join the global Engie family and look forward to embark on a new journey that will see Engie Cofely combine Engie’s global expertise with CBFM’s robust geographical presence and capabilities." "This will give our local customers the best of both worlds, while allowing us to expand further across the region,." he added. Engie and Besix agreed that their shared success in CBFM has demonstrated the strength of their ten-year partnership in the region, and they will continue to explore regional opportunities in a bid for sustainable success. Cofely Besix Facility Management is a joint-venture established in 2008 by Cofely and the Besix Group, to provide first-class integrated facility management services in the Middle East.